Seventh Seal research papers analyze Ingmar Bergman's film of a man searching for God among death. Research papers on The Seventh Seal review or critique the classic film. Your project will be custom written and focus on any aspect of Bergman's classic film. Ingmar Bergman’s classic film, “The Seventh Seal”, is the story of a man’s search for answers in the face of death. The hero of the story, Antonius Block, a knight returning home from the Crusades in the midst of the Black Plague, is being followed by Death and he desperately searches to find some proof of God’s existence before he is taken. The film depicts a 14th century Europe in which fear and paranoia reign over all, as people prepare for what seems surely to be the end of the world; punishment from God for the sins of man. In one of the film’s early scenes, one gets a very good idea of what it must have been like to live in such a period of fear, when the dreaded Black Death could strike at any time and spread like wildfire from village to village. There is a scene in which a man is painting a mural on the wall of a church that depicts the Black Death. He vividly describes what happens to those who get the disease, “You should see the abscesses. The limbs knotted in frenzy. They try to tear out the boils. They bite their hands. Scratch open their veins. People think the plague is a punishment from God”. It is as though the church is capitalizing on and perpetuating people’s fear. There is a scene that depicts people flogging themselves in penance, and another in which it is mentioned that people burn themselves to death to purge their sin – “better this than burn in hell”. From a historical standpoint, the writers at Paper Masters found this film to be a bleak, yet accurate depiction of 14th century Europe, a time when great wars were fought in the name of God. With so much killing and fighting in God’s name, it seems to have been a time in which religion was based more in fear than anything else. In the modern world God is viewed as a kind and benevolent God, but that is not the case here. Here, life seems hopeless and the afterlife very uncertain. That is the dilemma of Antonius Block. After fighting and killing for many years in the Crusades, he longs to see some sort of proof that God really does exist, and that it has not all been in vain. It is not hard to understand his doubt. Imagine returning home from war only to find your people suffering and dying by the thousands from a horrible disease, people turning on one another in paranoia, madness at every turn. Surely it would cause one to wonder who is up there looking after the people; where is the Shepherd to guard his flock? In one of the film’s best scenes, Antonius goes into the church confessional and pours out his heart to a priest, saying, “My indifference has shut me out. I live in a world of ghosts, a prisoner of dreams. I want God to put out his hand, show his face, speak to me. I cry out to him in the dark but there is no one there”. At that moment, the hooded figure he has been speaking to turns, and is revealed to be, not a priest at all, but Death himself, only furthering Antonius’ doubt. But he does not give up. Later, when asked when he will stop asking questions, Antonius, perhaps speaking for all of mankind, answers, “Never”. Later, Antonius asks the young girl who is about to be burned at the stake for sleeping with the devil if she has indeed seen the devil. He too wants to meet the devil because he figures the devil will surely be able to answer his question. That is the very definition of desperation; to be willing to confront the devil in an attempt to find out the truth about God. Later, when the girl is being burned, Antonius and his squire, Jons, look into her terrified eyes and Jons observes that “she is making a terrible discovery”. He believes that in the girl’s moment of death, the moment in which the mysteries of life are believed to be revealed, she sees nothing but “emptiness”. No heaven, no hell – just nothing. Antonius cries out in horror, “No! It can’t be!” In my opinion, this is the most powerful moment in the movie. As human beings, many people are only able to face the trials of life on earth because of their faith in a glorious afterlife. To find that there is nothing after changes the “game” completely. Death is personified by the creepy man in the black hooded robe. Death is ever present as the Black Plague itself. Bergman’s choice of setting this film in the time of the Black Plague makes great sense. It was a time in which no one was safe, and anyone, regardless of age or health, could be taken at any moment. The theme of the film of death illustrates that there was perhaps no other time in history when man was so blatantly confronted with his mortality. And yet through all this darkness, the beauty of life is ever present, represented by the beautiful young family of Mary, Joseph and their baby, Michael. When Antonius meets them they sit on a beach and eat wild strawberries and drink fresh milk while Joseph plays his lute and for this moment all is right with the world. Antonius makes a point to remember this moment, for in it he has perhaps found at least some proof that life is indeed worth living and that such moments can only be gifts from a kind and benevolent God. By delaying the conclusion of his chess game with death, Antonius is able to save the young family from the Plague, and in doing so he has served the purpose of his life. 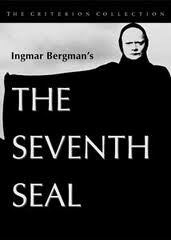 The writers at Paper Masters found “The Seventh Seal” to be a very enlightening and enjoyable movie. It is certainly worth watching. It asks some very important, universal questions about life and death, and sheds light on both the wisdom and ignorance of man. The answer to Antonius Block’s question of whether or not God exists, is sure to remain a mystery to mortal men. But this film shows that by seeking the answers to impossible questions we are bound to stumble upon some other tiny truths that just might make the whole quest worthwhile. Death in the Seventh Seal is not only personified by the creepy man in the black hooded robe, but also ever present as the Black Plague itself. Spanish Flu Pandemic - Spanish Flu Pandemic killed between 20 and 40 million people and spread very quickly around the world. Giovanni Boccaccio - Giovanni Boccaccio research papers look into the Italian Renaissance writer and poet, best known for the Decameron. Aids Drug Assistance Program - AIDS Drug Assistance Program Research Papers examine the programs primary purpose and discuss the CARE Act. HIV Around World - HIV Around the World Research Papers look at a sample of how to order a power point presentation with detailed instructions about whats needed. Leprosy - Leprosy is a physical disease that was thought to mean one was morally corrupt but the stigma perished after the discovery of the disease occurring naturally in wild armadillos. Yellow Fever - Yellow Fever research papers examine the viral disease that is transmitted by female mosquitoes and discuss the various symptoms. Paper Masters writes custom research papers on Seventh Seal and analyze Ingmar Bergman's film of a man searching for God among death.